free platforms on the internet that can provide you with vendor information. But sourcing requires more than simply contacting manufacturers; it necessitates a verification process. Here at CSO we want to let you work with your manufacturers directly so you can get net factory prices and be competitive. We also want to allow you to be able to speak with your suppliers directly and without intermediates so that communication will be quick and effective. A good sourcing process not only identifies potential factories but confirms the manufacturer actually meets the needs of your organization. Costs and expenses increase when businesses inexpertly attempt to navigate the hazards of the verification process. The primary concern for any company working with Chinese vendors should be managing the risks that inevitably arise when working with new and unfamiliar partners. These risks can be mitigated remotely to an extent. Your business can call manufacturers, arrange Skype calls and interviews, read customer satisfaction reviews, etc. While these are helpful places to begin, they will never be able to provide you a complete picture due to their natural limitations as sourcing aids. 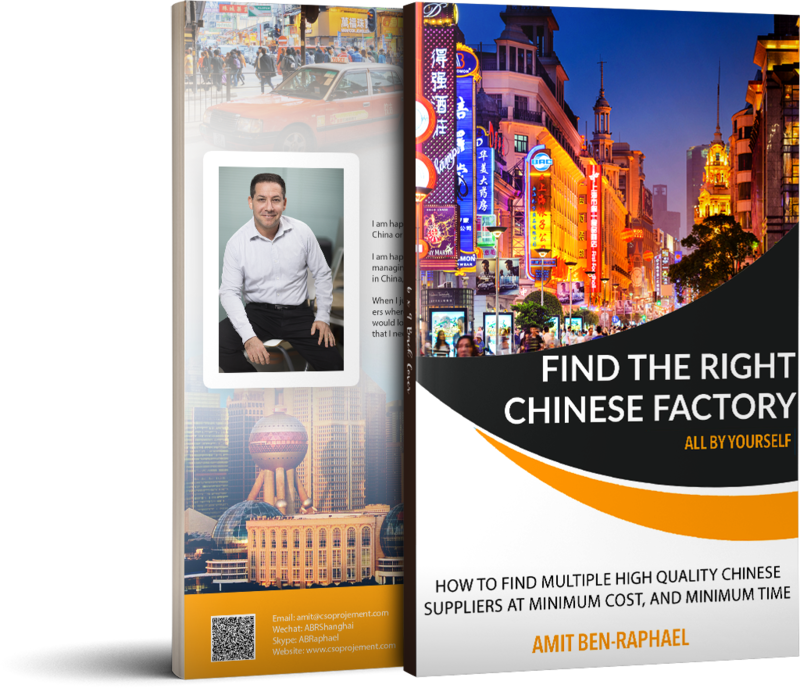 The only way to assuredly source a potential manufacturing partner is to have your representative visit the site, either an actual employee or a third party China buying agent. CSO can provide your organization with an experienced and professional buying agent in China. Our staff has been working with Chinese factories and manufacturers for over 20 years. We will help you navigate the pitfalls and delays that naturally occur while trying to conduct business in a foreign land, with an unfamiliar culture, while overcoming a language barrier. As your buying agent in China, we utilize our experience to reduce the risks working with manufacturers entail. ensure We help you identify reliable manufacturers you can feel safe entrusting with your time and money and are actually capable of consistently producing quality goods. We do all of this before even checking the product itself. CSO will provide your organization with a list of verified manufacturers that we know to be of high quality. That way you can avoid the most basic stumbling blocks and focus on finding the right fit for your organization. We will always give you the last say on everything. With us, your company maintains complete control over costs, and only pays net factory prices. These two principles inform the sourcing methodology utilized by successful buying agents in China. The best way to combine both principles is to create a metaphorical sieve to filter out nonviable vendors. The ideal sieve operates in two stages that will hopefully leave you with a short list of viable factories after their completion. The first stage relies on remote inspection – email, phone, internet queries, etc. to narrow down your list of possible vendors. Stage two calls for the in-person inspection of viable factories and their processes. If your company lacks the knowledge and experience to conduct an inspection, it’s best to hire a China buying agent. Before you begin your search, it is important to have a clear understanding of the attributes that determine a qualified supplier. The best way to do this is to create a list of desired manufacturer attributes. Required capacity size or production capabilities. Begin by collecting supplier names and contact information using online platforms, business references, search engines, trade shows, etc. Make sure to disqualify factories that don’t fit your target profile as you search. The demands of your industry or company may leave you with a sparsely populated list or an oversaturated one. The more factories you initially have, however, the better. You should never enter negotiations without having alternative options. Avoid having to compromise simply because “there is no other choice”. If you can’t find enough candidates, we suggest hiring a sourcing agent in China via our Factory Sourcing service. It’s offered at a promotional price and is designed to save your company valuable time and money. First conduct an internet search for the supplier. Quickly gather intel by utilizing public domain information to determine if the vendor is worth contacting. Be on the lookout for useful information like date of incorporation, geographic location, product range, and relative market experience. Sometimes the information will only be accessible in Chinese. This isn’t an issue for companies with Chinese language capabilities. If it is problematic, consider using our Factory Internet Search service, starting from USD $400.00. Any type of remote inspection is going to yield shallow results. Follow up the initial internet research with the first contact to get more useable information. Initial contact with a potential manufacturer can be complicated; you want to introduce the factory to your organization while simultaneously vetting them for useful information that will help you decide whether to work with them or not. The best way to achieve this is to send potential vendors a self-explanatory form requesting harder to come by supplemental information, like the total area of the manufacturing facility, number of employees, or sales distribution numbers between the vendor and their markets. Keep in mind that vendors are operating a business, and their time is just as important to them as it is to you. They are not likely to take the time to fill out a form requesting sensitive company information if they do not know the sender. Therefore, it is best to accompany the form with an introductory email that includes information about your company and explains the form. After all, the price range for manufacturing your product is of the utmost importance. The price is one of the primary considerations in determining the cost of doing business; it directly affects your bottom line. At CSO, we do not recommend using price to filter out factories – at first. Quite frankly, getting a good price out of manufacturers is a challenge in its own right, and there are other essential determiners used in the sourcing process that can be assessed first with less headache. Nevertheless, after you’ve sent the Introductory Supplier Email form, you should begin wondering about the price. Now that the factories on your list know who you and your organization are, start requesting quotes from them. Send them a mockup of product specifications that are similar to yours and already on the market. International phone calls are no longer an issue in today’s saturated digital communication service market. Services like WhatsApp and WeChat make international communication easier and more accessible than ever before. Even landline restricted businesses have access to affordable long-distance packages. The phone interview is your first person to person contact that you’ll have with the vendor. It is your chance to supplement the introductory form and prior research by asking more in-depth questions about any concerns you might have. Perhaps more importantly, however, is the phone interview gives you the chance to assess the person on the other end of the line. Make sure to take full advantage of this opportunity; determine if you can communicate well with each other, if they listened to your concerns, if they seem honest, etc. Remember, while you are sourcing a factory, it is sourcing you. You should be trying to impress upon the factory that doing business with your company is in its best interest; they should be adding your company to their customer list by the end of the interview. The more effective you are in completing the first stage, the more affordable this stage will be. At this point, you should be left with a short list containing a few to a dozen factories that you have deemed worthy of visiting. These should be vendors that you really like on paper and have good reasons for working with. You should be inspecting key elements of the manufacturer’s operation during the visit. The specific elements are dependent on your specific organization. Some elements worthy of inspection include the factory’s facilities, warehouse management, production floor management, machinery maintenance, quality control management systems, documentation, communication lines, and the showroom. The logistics of auditing a factory yourself can be complicated and overwhelming for the inexperienced. Avoid that by considering our Factory Audit service. The service quickly assesses a vendor’s entire operation, including the hardware and management system, and present your business with a useful manufacturer assessment. The service is offered at highly competitive prices. 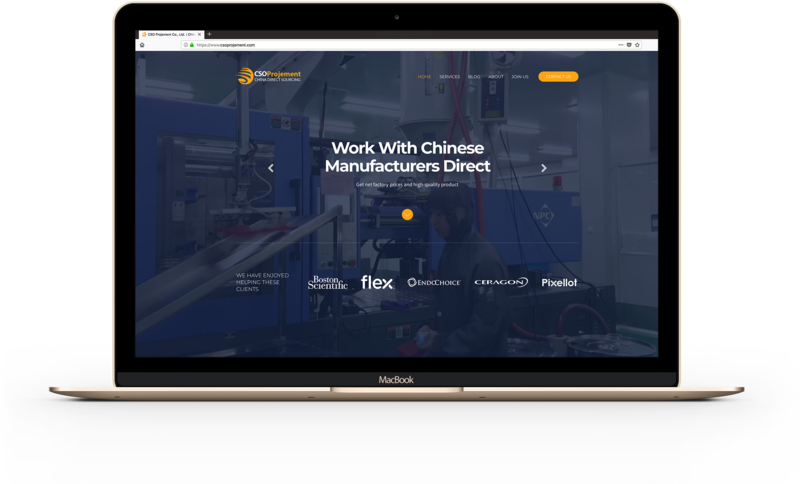 Contact us now for a free consultation with no commitment from your side..
A service provider helping non-Chinese companies work directly with Chinese factories. Our customers are tech-based SME’s for whom price and quality are equally important and to whom protecting their reputation is a top priority. Our customers are companies that cannot afford paying commissions or third-party margins on top of the net factory price. They are companies with complex products and complex supply chain. Our clients understand that they must work directly with their manufacturers for improved communication and fast decision making. They are companies for whom quality and cost are important uncompromising concerns, and want to be involved in the order follow up process, but cannot afford to let it consume too much of their time. It is designed to help companies find factories capable of manufacturing high-quality products at a competitive price. At CSO we understand the one resource more important to our customers than money is time. This is why we designed this service for SME’s that have little to no presence in China. Our team is professional and experienced, possessing extensive local knowledge that can help companies through the vendor approval procedure, including a factory audit. We designed this service to take the complexity of managing the purchasing process in China into account. Working with factories in China can be a big risk; this service helps minimize those risks while remaining affordable. We live in an era when travel to China and communication with Chinese companies have become simple. Never before have people been able to do so much with so little support in China as they do today. We provide the right support, at the right time, exactly when you need it, for as long as you need it. Complete The Vendor Information Form. Please be as informative as possible. Indicate on the form which service you are interested in and send it to us. We will ask you to pay the service fee. We will submit the reports according to the time frame indicated for each service package. We will first set a schedule according to the number of factories and their location. After we understand the entire cost we will give you our quotation. We will then ask you to pay the service fee. Finally, we will submit the audit report 7 days after the audit is complete and according to the schedule agreed upon.